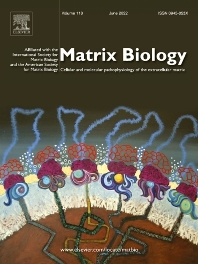 Matrix Biology (established in 1980 as Collagen and Related Research) is a cutting-edge journal that is devoted to publishing the latest results in matrix biology research. We welcome articles that reside at the nexus of understanding the cellular and molecular pathophysiology of the extracellular matrix. Matrix Biology focusses on solving elusive questions, opening new avenues of thought and discovery, and challenging longstanding biological paradigms. Papers considered for review, and ultimately for publication, must contain substantial advances supported by mechanistic and functional insights germane to important physiological or pathological processes. These aspects are crucial and required for publication. Matrix Biology welcomes original research articles, brief reports, commentaries, (mini) reviews, and announcements. Please view our Guide for Authors for more information. The premier journal in matrix biology; published articles have a universal appeal, value, and utility to the researcher community worldwide. High impact metrics: find our current metrics in the left-hand column. An international board of key researchers in the field. Rigorous, fair and efficient peer review process. Your paper your way: no unnecessary formatting requests. Flexible publication: you can choose to publish open access. Rapid publication: your article available online within a week after acceptance. No page charges and no color charges for online version. Option of co-submitting a data article to Data in Brief.